Yesterday the President delivered his final State of the Union address, and one thing is certain: the state of the Union was strong. The state of Asian Americans and Pacific Islanders is growing stronger, too--but not for the reasons that are commonly (mis)portrayed. The state of AAPIs is often characterized as strong because we are so-called "model minorities." On average, Asian Americans have the highest educational attainment and highest median household income. Some have even suggested we have an "advantage." Unfortunately, the stereotype is a myth. But it's a myth not only because the AAPI community is not monolithic. It's true that more closely examining the diversity of our community--spanning nearly 50 ethnicities--reveals disparities and real needs with respect to education, poverty, and more. However, the myth goes far deeper than this. It is used more often against us than to reflect something positive about our community. We are considered "model minorities" to justify the lack of philanthropic investments in our community, which is just .3 percent of foundation investments. We are considered "model minorities" to excuse the lack of disaggregated data and in-language government resources for our community. And we are considered "model minorities" in an effort to create a wedge between us and other communities of color (as the "non-models")--thereby limiting our potential strength as part of the coalition that will establish the new American majority. While we bear the burden of being the "model minority," we reap very little of the benefit. For example, we are not considered "model minorities" when the Gallup poll won't even ask whether Americans would vote for an AAPI presidential candidate. We are not considered "model minorities" when the federal government suspects or charges Asian American scientists with crimes related to economic espionage without the full support of the facts. We are not considered "model minorities" when the only two women ever charged with feticide under Indiana law are Asian American--including the first woman ever to be sent to jail for terminating her own pregnancy. And we certainly are not considered "model minorities" when anti-Muslim hate crimes escalate against Muslim, Sikh, South Asian and Arab Americans. Instead, in these instances, AAPIs are excluded because of another stereotype--that of the "perpetual foreigner." The idea that we are not American. That we are "really from" somewhere else. This is the discriminatory attitude that led to a 1998 headline that "American Beats out Kwan" when Michelle Kwan, one of the most decorated American figure skaters of all time, earned a silver medal in the 1998 Winter Olympics. This is the prejudiced mindset that inexplicably produced a headline four years later that "American outshines Kwan" when Kwan won a bronze medal for our country in the 1992 Winter Olympics. This pervasive aggression--that we will always be considered "other"--leads to a search for belonging that can drive one to the false comfort of being considered a "model minority." But we must recognize that these two stereotypes really are two sides of the same coin of exclusion. Sometimes, it feels like society uses this coin against AAPIs in a cruel game of "heads I win, tails you lose." And yet, there's no question that our community is stronger than it's ever been. We are the fastest growing racial group in the nation, and by 2040, nearly one in ten Americans will be Asian American. We already have reached that threshold in the West. 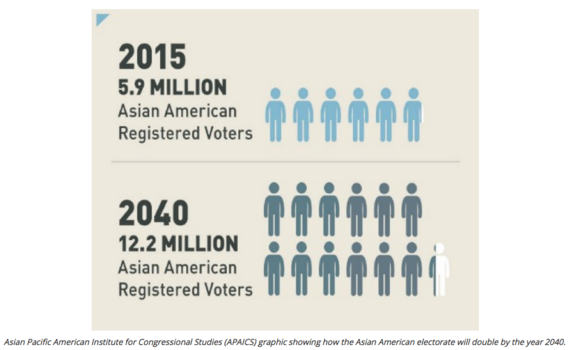 Politically, Asian Americans have been the fastest growing electorate since 2000, and the number of Asian American registered voters will more than double by 2040. We are moving from marginalized to the margin of victory. 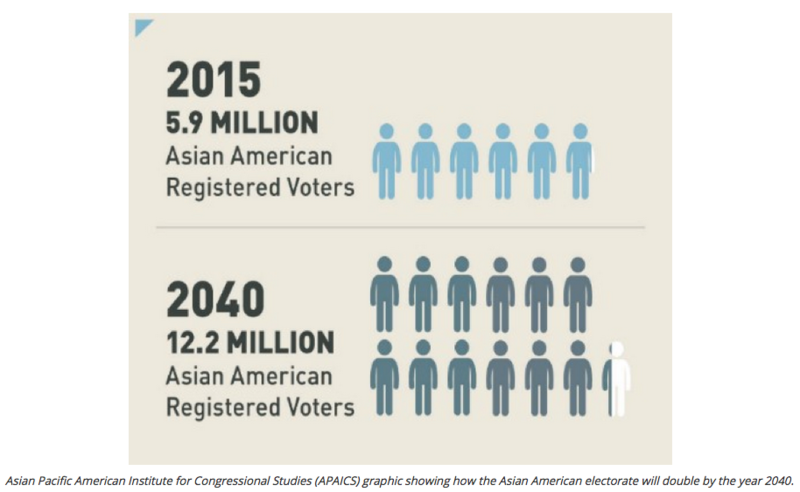 In seven states and 103 Congressional districts, AAPIs are at least 5% of the citizen voting age population. In battleground states in the upcoming presidential election, AAPI voter turnout and margins could determine the winner. We are taking charge of our future, to narrow the gap in citizenship and voter registration, increasing our political power even more quickly. We have progressed from MSNBC's "American Beats Out Kwan" headline to NBC News launching NBC Asian America, dedicated to the issues and voices of our community and already one of the largest English-language AAPI news sources in the country. And Michelle Kwan herself went from representing America on the ice rink to doing so at the State Department. She now works for Secretary Clinton's presidential campaign as one of many senior AAPI staffers who embody political empowerment. Last weekend marked the 50th anniversary of the term "model minority," and the Smithsonian Asian Pacific American Center launched a #ReModelMinority campaign to educate the public about the stereotype's negative impact. Asian Americans and Pacific Islanders must join this effort to push back on harmful stereotypes, but at the same time, we must promote the emerging strength of our community. If we don't define our own strength, we will allow others to do it for us--or worse, to assume we have no strength at all. While our community isn't as strong as it can be or will be, the state of Asian Americans and Pacific Islanders is growing stronger--and it's time that the media and society understand why. Unfortunately, data for Native Hawaiian and Other Pacific Islanders was not available in either report. This piece was originally posted on the Medium page of the National Council of Asian Pacific Americans.